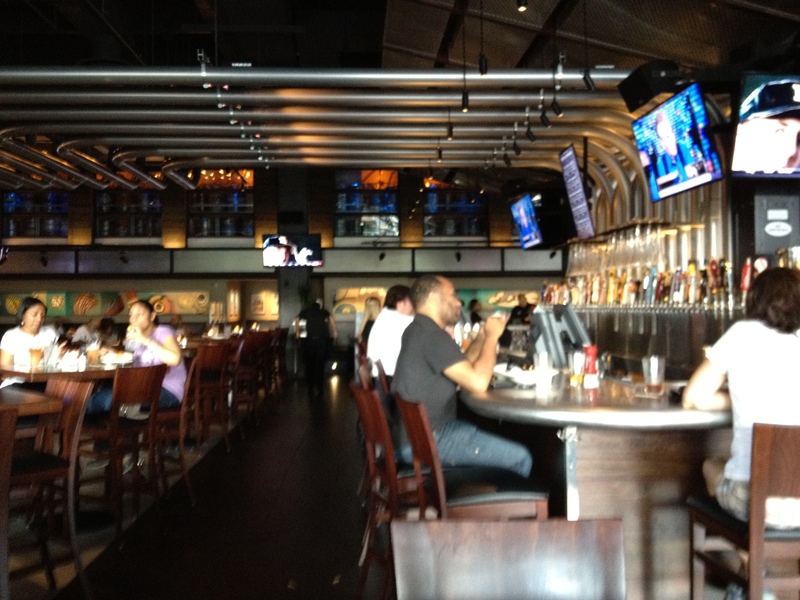 So where can you find 130 beer taps, half price appetizers from 3-6, and about a dozen 50″ plasma tv’s running sports? It sounds like a Taco Mac, but it’s way more upscale and trendy and it’s in Atlantic Station, which is a new location for Date Night! Some Date Nights are scripted well in advance, this one was ad-libbed, and we are thrilled to say that the Anniversary celebration is a Hole-in-one (we are watching Tiger leading at the US Open). All we can remember is that we have heard about a place in Atlantic Station which has a vast selection of beers. A Google search gives us the name and address and we are on our way to the Yard House. 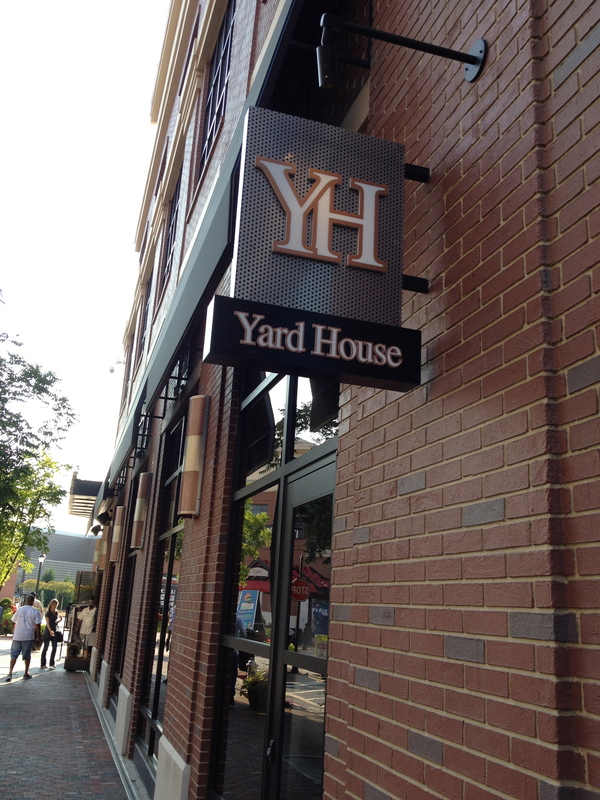 The Yard House, as in yard of beer. Oh, we have been here before, and you may have too. It was Ten Pin Alley, pricey and trendy. We came here several times for events, but evidently Atlanta did not think that $40 an hour was a good price for bowling. The pipes in the ceiling are full of beer. It has been transformed into a large, high-ceilinged room with an impressive bar in the center. The showcase is a beer distribution system that originates upstairs (in the former bowling alleys) and snakes through the ceiling in stainless steel pipes and into the vast array of beer taps. It’s impressive! What is also impressive is the amount of food coming out of the kitchen and the number of black-clad servers that work here. This place is abuzz with activity, from the employees to the chatting customers, all who have ordered beers and food, which keeps “walking” by our nicely-situated table. We have NOT tried so many of these beers, and the choice is extremely hard! Tonight I am not sampling any local brews, I order the Belgian Six Pack. 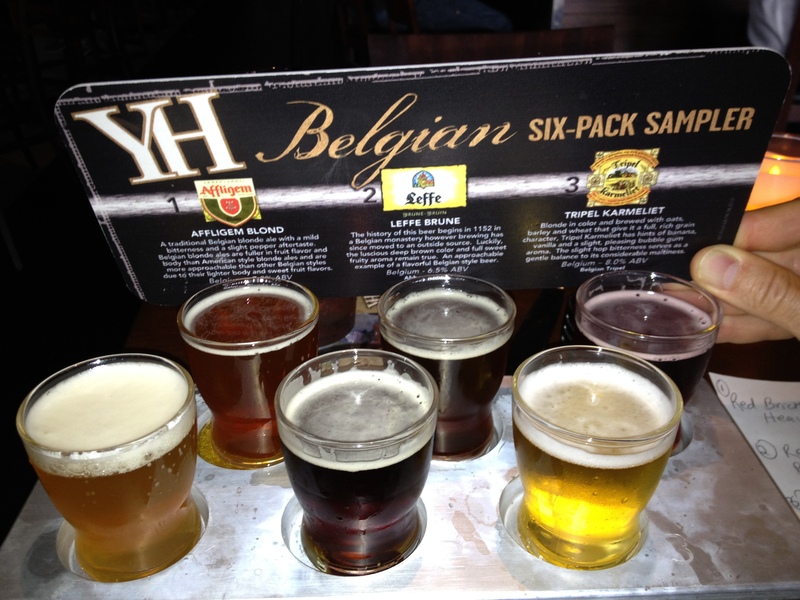 The Belgian six-pack. More muscle than Jean-Claude Van Damme! This is a sampler of 6 incredible beers. All are delicious, but this is NOT the price performer. The samples are maybe 3 ounces each and the price tag is a whopping $10.25 – yes, some of the tastes are more expensive high alcohol beers, but I usually order the sampler when available, and in most places it has larger samples and smaller price tags! Black cherry. A good mix. Roger loves when beers are mixed together, and not just because they have cool names like “dirty hippy” and “dark castle”, he enjoys the taste too! 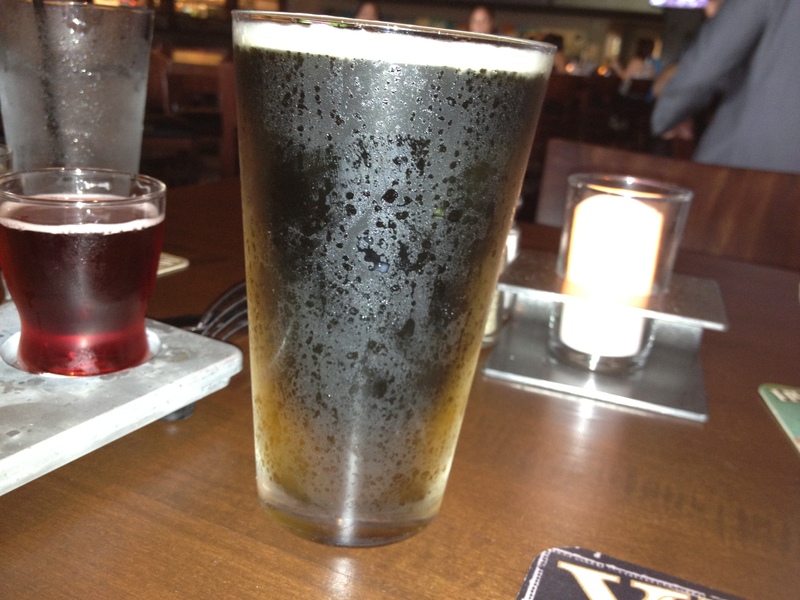 He is intrigued by the “black cherry”, which is Samuel Adams Cherry Wheat mixed with a Scottish stout. This turns out to be wonderful combination and we are both happy with our selections. When we look at the (huge) menu, we learn that many “small plates” are on the “Happy Hour” menu which means they are half price from 3-6pm. We are early, so we are in! Little plates are one of our favorite date night treats. We are able to share and to sample many dishes. And we don’t leave dinner with that overfull feeling. As we examine the menu we see many plates coming out and they all look fantastic! 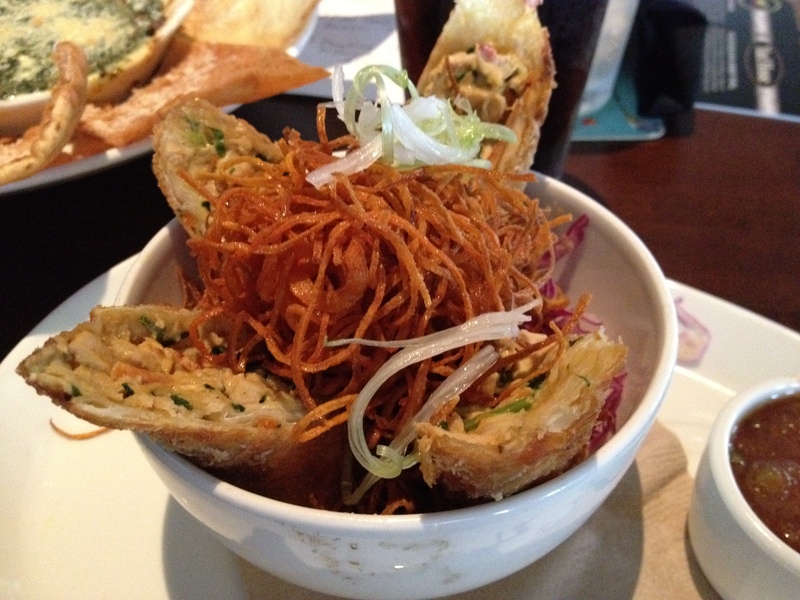 We order a baked spinach cheese dip with toasted flat bread and the moo shu egg rolls. 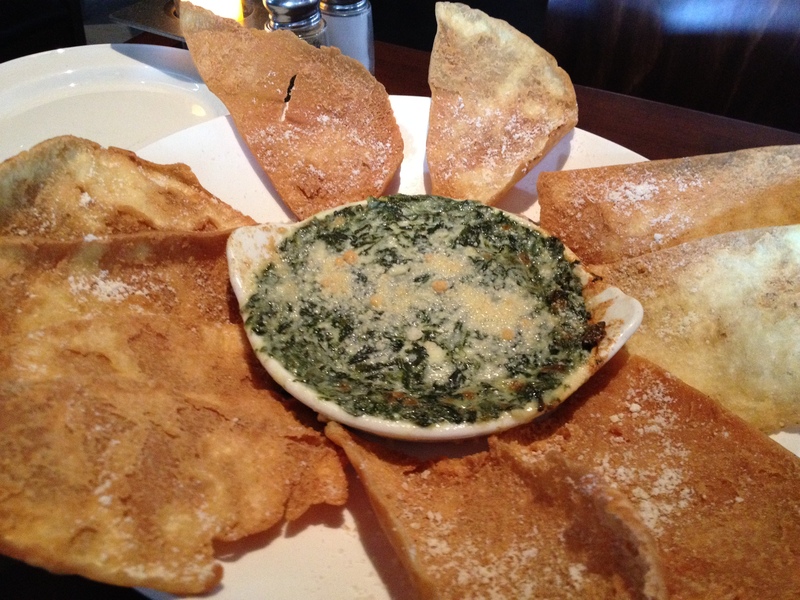 Spinach cheese dip. The bread was nice and crispy. Both dishes get an A+ for presentation and taste. They taste as good as they look and they are also both nice-size portions. Mu-shu egg rolls with a topping of fried sweet potatoes. 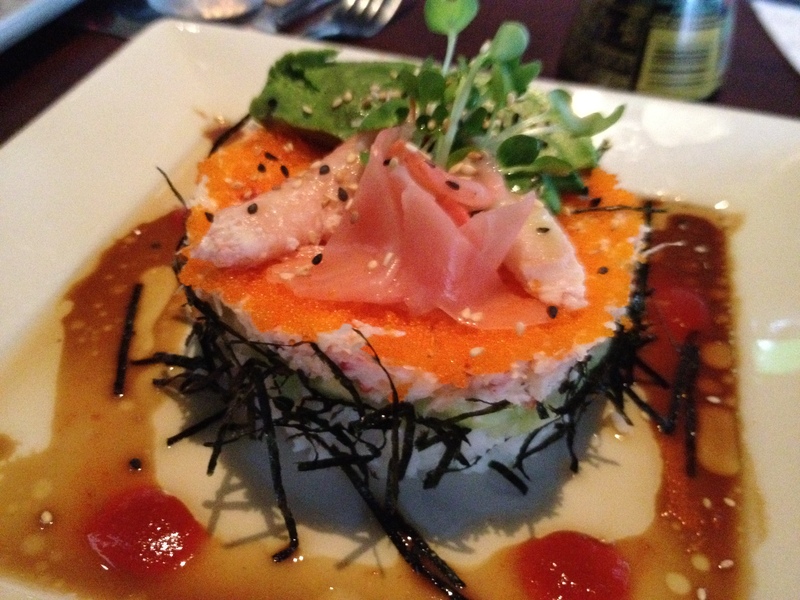 We order one more plate which is an unusual take on a California roll. It looks like sushi on steroids with a crab filling that is soft and tasty. Sushi on steroids. The portion is huge, but at half-price, eat all you want. That’s wasabi sauce on the side. Roger has ordered a second beer, a 9-ounce shorty of Leffe Broun, which may be the best beer from my sampler. The beers are pricey, but the weekday happy hour has made the food pretty reasonable so our tab is in our “normal FDN” realm and we have had a great time. 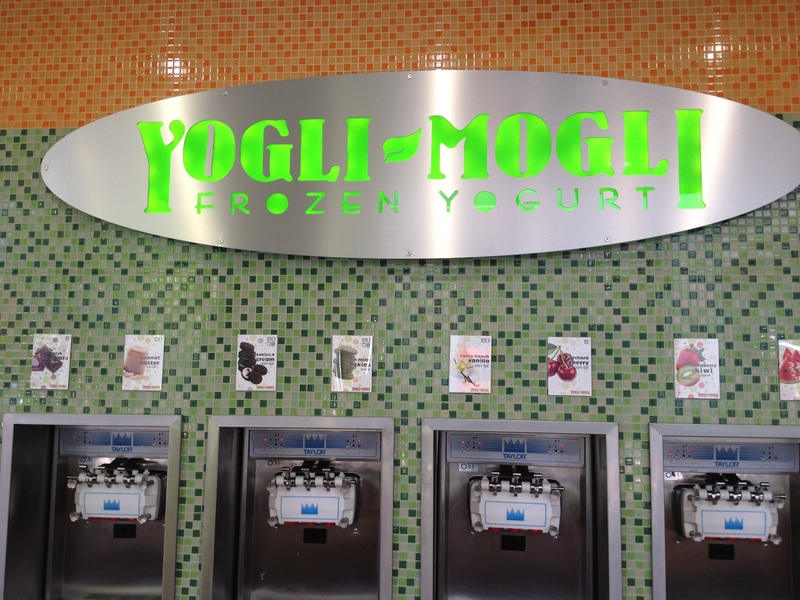 More good news: there is a Yogli Mogli very close by, and we have saved some room for dessert! Self-serve yogurt. Great on a warm night. 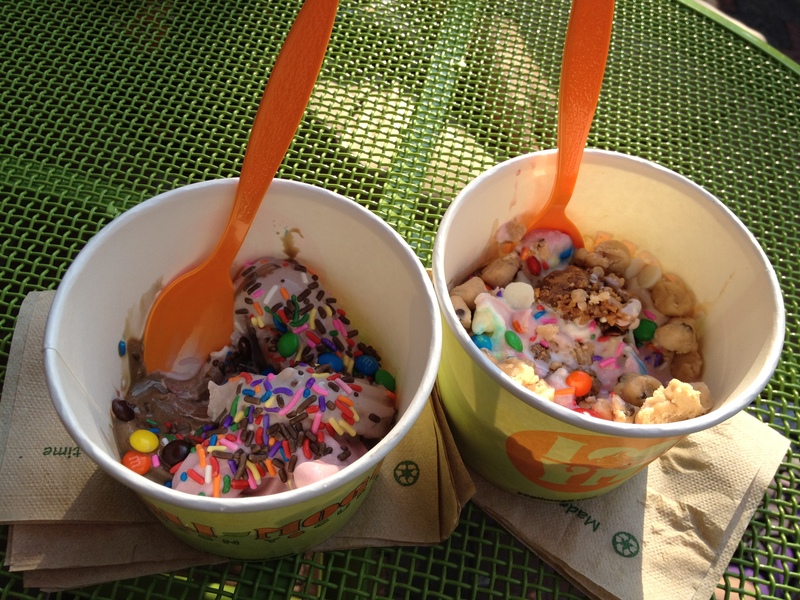 If you haven’t visited one, it’s a self serve yogurt and topping emporium. More choices with a very high “yum” factor. Don’t put too much in, because it’s priced by the ounce. After dinner and dessert we are enjoying the beautiful evening and strolling through Atlantic Station when we remember the signs we saw for Friday night free concerts, so we head over to check out the scene. Yeah, yeah, yeah! John, Paul, Ringo, and Larry. We are thrilled when we discover that the Buggs are performing. 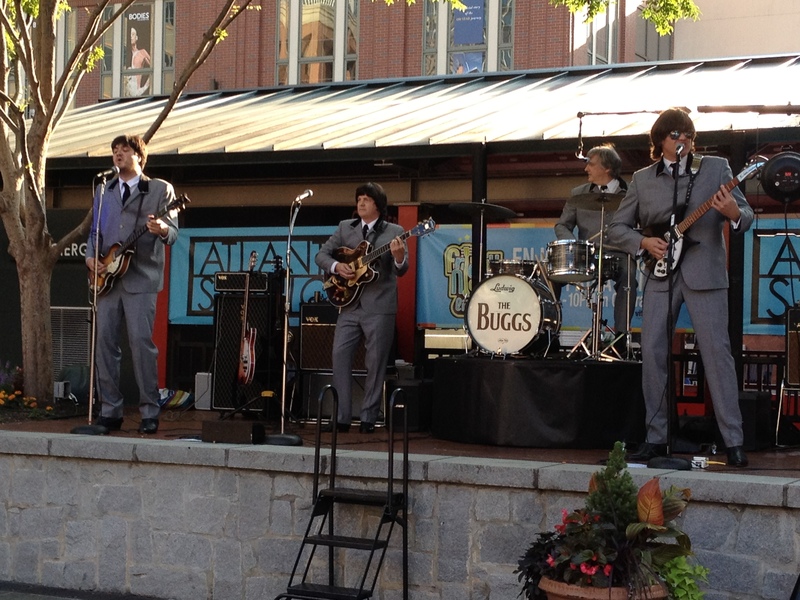 We have never heard of them, but they are a Beatles impersonator/cover band with authentic suits and instruments. Even the guitar player is named Harrison, Larry Harrison. We pull up some Astro turf and the fun continues with some of our favorite music. The one year anniversary of Date Night turns out to be an unplanned, but very memorable evening. As we leave, we are hit with an $8 parking bill, our price for staying too long in the Atlantic Station parking lot. The first two hours are free, but after that it will cost you. We don’t care though, as we have had a lot of fun here.